The DH9 development was started in order to give the RFC a means of hitting back at the Germans, who had raided London in daylight in June and July 1917. 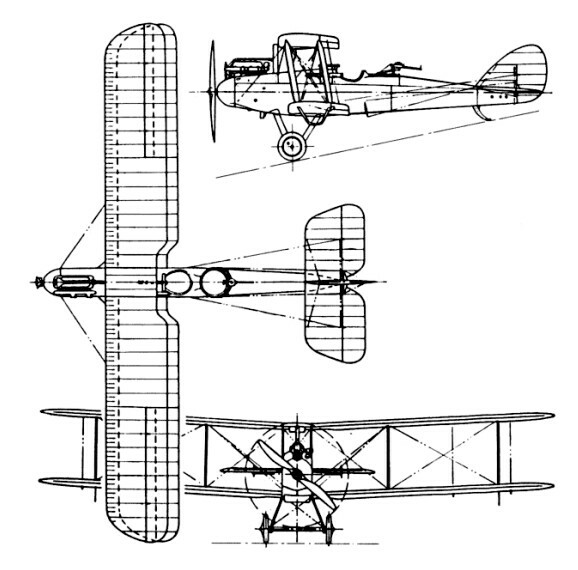 Based on the DH.4 two-seat day bomber the result was the DH.9. 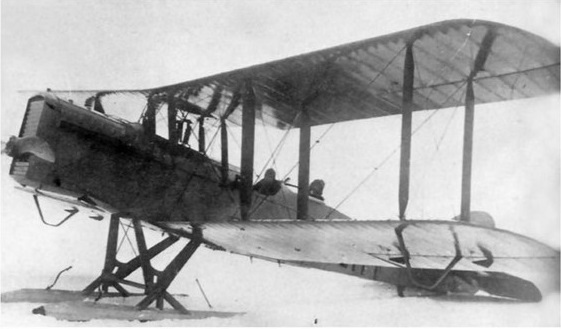 The prototype Airco DH.9 was pro­duced by modification of a DH.4, retaining the same wings, tail unit, and generally similar landing gear, but the fuselage was completely new, with a more streamlined nose, and the pilot’s cockpit directly above the lower wing trailing edge. In the DH.4 there had been a problem with communication between the pilot and observer because the two cockpits were too far apart, but in the DH.9 the cockpits were almost back-to-back. First flying in November 1917, the prototype was powered by a 172-kW (230-hp) B.H.P., built by the Galloway Engineering Company, and referred to sometimes as the Galloway Adriatic. Early testing began in late July 1917 and proceeded so well that existing contracts for 900 D.H.4s held by sub-contractors were amended to cover production of the D.H.9. Some of these early production aircraft had a Siddeley built B.H.P. engine, but a new light-weight version of this engine, known as the Puma and developed by Siddeley-Deasy, was selected as the major production engine. Most D.H.9s were fitted with 230, 240 or 290-hp Siddeley Puma engines, although one small batch, built by Shorts, had 260-hp Fiat A-12s. Rated at 224kW (300 hp), it was expected to give the D.H.9 out-standing performance, but development problems meant that reliability could only be assured by de-rating output to 172kW (230 hp), and the performance of the new bomber was inferior to that of the D.H.4 which it was intended to replace. When the type was first introduced in April 1918, this resulted in serious losses by the squadrons in France. Carrying a full military payloaad the aircraft could barely make 13,000 ft. The problem was highlighted on 31 July 1918 when ten DH.9s out of twelve on a bombing mission over Germany were lost, some to engine failuew other shot down. During 848 sorties flown by Nos 99 and 104 Squadrons, RFC, 123 engine failures were recorded. In ex­cess of 3,200 were built in Britain by Airco and 12 sub-contractors, including Westland Aircraft. By the time the prototype flew, Trenchard had already asked for its cancella­tion, but production was already well advanced and there was no immediate substitute. Deliveries of the D.H.9, to No 103 Squad-ron of the RFC, began in December 1917, and the first operational sorties (by No 6 Squadron) were carried out in France in the following March. Over the next few months their activity was stepped up quite considerably, but with operations affected by the lack of power from their Puma engines, or made abortive by repeated engine failures. With the end of the war the D.H.9 soon faded from the RAF scene, eclipsed completely by the D.H.9A which replaced it.Developed from the DH.9, the DH.9A had a 375 hp Rolls-Royce Eagle VIII engine fitted at the behest of the Technical Department of the War Office. To accommodate this larger engine the mainplanes and ailerons were enlarged and the fuselage strengthened, but he undercarriage and tail section remained the as the DH.9. Harry Hawker carried out a number of the initial test flights. With the test completed, a number of the aircraft were assigned to No.110 Sqn, RAF, who used them to carry out bombing raids on Coblenz, Frankfurt and a number of other German manufacturing cities. 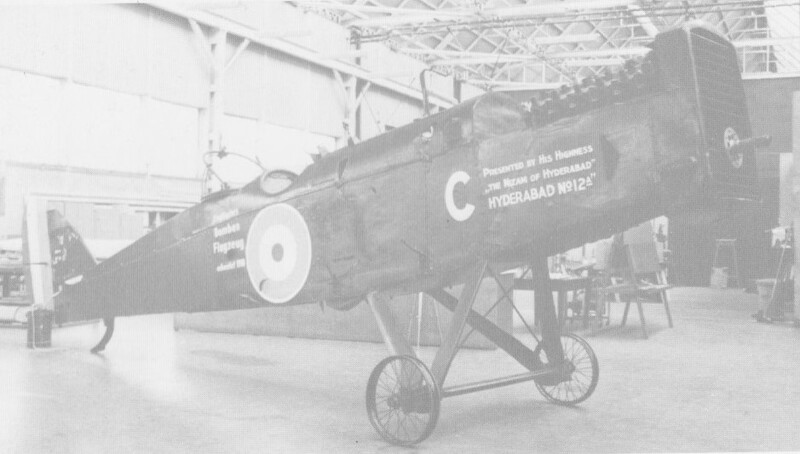 One of the aircraft had been paid for by the Nizam of Hyderabad, commemorated by an inscription painted on the side of the aircraft. Armament comprised a front-­mounted, forward‑firing 0.303‑in (7.7‑mm) Vickers machine‑gun, with Constantinesco synchronizing gear, and a 0.303‑in (7.7‑mm) Lewis gun on a Scarff ring mounting in the rear cockpit. Normal bombload consisted of two 104‑kg (230‑lb) or four 51‑kg (112‑lb) bombs, which could be carried internally (though they seldom were) or externally, on fuselage or lower‑wing racks. Camera or W/T equipment was also installed. To improve performance of the DH9, the Liberty 12 engines were ordered from the USA, and Airco requested the Westland Aircraft Works at Yeovil, Somerset, to redesign the D.H.9 to accept the Liberty engine. Westland combined the best features of both D.H.4 and D.H.9 with the US powerplant, strengthening the fuselage structure and introduced wings of increased span and chord. Although nominally a conversion of the earlier aircraft, to take a more reliable American engine, the new DH9A was a complete redesign. The prototype Airco DH.9A, because no Liberty engines had been received, was flown initially with a 280-kW (375-hp) Eagle VIII engine. 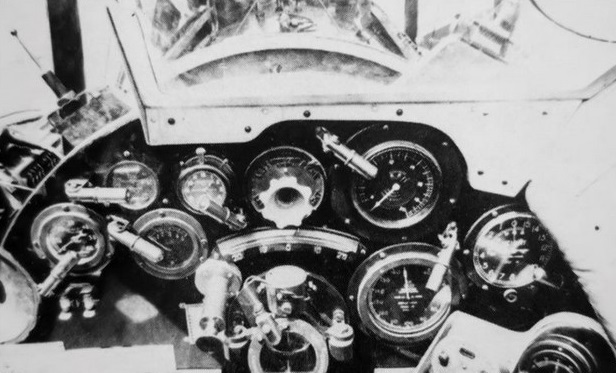 By the middle of 1918, the converson to the Packhard Motor Company-built Liberty engine had been completed and the aircraft was sent to Martlesham Heath foe evaluaton, while at the same time the Americans were promising deliveries of the engine. Twelve of the engines were already in Britain, and tests with the Liberty-powered DH.9A had been extremely encouraging. A number of different sub-contractors had to be brought in because Airco were heavily committed to the design and development of the DH.10 day bomber. Among the sub-contractor were the Vulcan Motor and Engineering Co, the Westland Aircraft Works, Mann, Egerton Co,, the Whitehead Co, and F.W.Berwick. 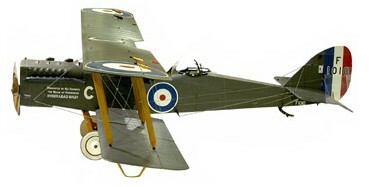 The first de­liveries were made to the RAF during June 1918. The deliveries of the Ameican Liberty engines started to come in, but in July 1918 they stopped abruptly after 1050 had been delivered. Winston Churchill, who was Minister for Munitions at the time, immediately contacted the US Under-Secretary for Aviation, Mr Ryan. Ryan informed Churchill that the US Navy had staked a priority claim on all the Liberty engines that were currently under construction. This was devastating news to Airco, as they now had to find a replacement engine rapidly. The one that sprang to mind was the Rolls-Royce Eagle VIII, which was currently under evaluation in a Westland-built DH.9A. By the end of 1918 nearly nine-hundred had been built. Enquiries were also made of the 500 hp Galloway Atlantic engine that was currently under evaluation. Seventy-two of these engines were ordered in September 1918 with a possible increase to 1000, but only one was ever fitted into a DH.9A, which was re-designatd the DH.15. Construction not only continued in Great Britain but the type went into unlicensed production in Russia for the Red Air Force. An American production programme of USD-9s (the US designation of the Liberty-engined version) was planned but of the 14,000 ordered only four were completed. Following the installation of a 400-hp Liberty in a British testbed, 3000 Liberty engines were ordered from the USA to power the refined D.H.9A for the RAF. Only 1050 of these engines reached Britain in early 1918, from which 885 D.H.9As were powered before the end of the war. Apart from the powerplant, the chief differences from the D.H.9 were larger-area wings (to offset the bigger and heavier American engine) and a redesigned forward fuselage; armament and bombload remained unchanged. Deliveries were made from June 1918, initially to No 110 Squadron, but only two squadrons in France and two in Russia had become fully operational with them before the Armistice. Mass production, by a dozen British manufacturers (chiefly de Havilland and Westland), continued after the war; deliveries continued until 1928, and the total built eventually reached nearly 2500. Others, with various engines, were built in Spain, the USSR and elsewhere. 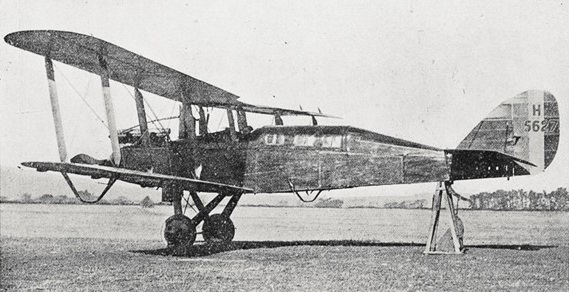 The D.H.9's basic design was phased out of RAF service in 1931. Those of the SAAF continued in service until 1937. Its RAF replacement, the Westland Wapiti, was based on the same airframe. War surplus D.H.9s served in Afghanistan, Australia, Belgium, Canada, Chile, Estonia, Greece, India, the Irish Free State, Latvia, the Netherlands, New Zealand, Poland and South Africa; and the type was built under licence by Hispano-Suiza for service with the Spanish air force, a figure in excess of 500 being quoted as the production figure, and at least 25 still being in service when the Spanish Civil War started in July 1936. Others were built by SABCA in Belgium; and the Netherlands Army Aircraft Factory also assembled 10 new D.H.9s, built by the de Havilland Aircraft Company in 1923, and in 1934 these were each given a Wright Whirlwind engine of 347kW (465hp). Despite this sort of demand, Britain’s Aircraft Disposal Company still had large numbers of war surplus D.H.9s in stock in late 1930, and these were scrapped and burned during the following year. Nine served with the RNZAF from 1923 to 1930.
for a Christchurch-Blenheim, New Zealand, mail service. D.H.9s were also flown experimentally or as a result of conversion with engines that included the 186-kW (250-hp) Fiat A-12, 216-kW (290-hp) Siddeley Puma high-compression engine, 224-kW (300-hp) A.D.C. Nimbus and Hispano-Suiza 8Fg, 321-kW (430-hp) Napier Lion, and 324-kW (435-hp) Liberty 12A. Conversions carried out by the South African Air Force, with the 149-kW (200-hp) Wolseley Viper, 336-kW (450-hp) Bristol Jupiter VI and 358-kW (480-hp) Bristol Jupiter VIII, were known respectively by the names of Mantis, M’pala I and M’pala II. Air Transport and Travel launching a proving flight between Hendon and Le Bourget on 15 July 1919. Its de Havilland 9 carried only one passenger, Major Wilkinson, of the glass firm. Production, during and after the First World War, eventually reached more than 4000, by no fewer than 15 British manufacturers, of which 3204 were built before the end of 1918. Airco D.H.9J: designation used for the SAAF M’pala I, and also for the D.H.9s modernised in the late 1920s for use by the de Havilland School of Flying. These latter aircraft had a strengthened forward fuselage structure; improved landing gear, aileron controls, and fuel system; introduced Handley Page leading-edge slots; and were powered by a 287-kW (385-hp) Armstrong Siddeley Jaguar III radial engine. Engineering Division USD-9B: designation of one USD-9A following installation of a 313-kW (420-hp) Liberty 12A engine. R-1 / R-2 - At least 2700 DH9As built in the Soviet Union by Polikarpov. Armament: one fixed forward-firing 7.7-mm (0.303-in) Vickers machine-gun and one or two 7.7-mm (0.303-in) Lewis guns on Scarff ring in aft cockpit, plus up to 209 kg (460 lb) of bombs. Wing area: 45.22m / 486.7 sq.ft. Armament: one fixed forward-firing 7.7-mm (0.303-in) Vickers machine-gun and one or two 7.7-mm (0.303-in) Lewis guns on Scarff ring in aft cockpit, plus up to 299 kg (660 lb) of bombs.